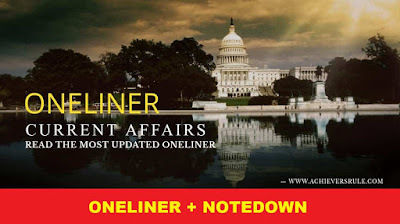 In the Current Affairs & GK Update of 27 September 2018 we cover all important National,International,Financial,Sports news, nominations, agreements which are relevant for upcoming IBPS PO,IBPS Clerk,SSC,IBPS RRB, INDIAN Bank PO exams.We at Achieversrule regularly provide One Liner Current Affairs and GK Updates to keep our candidates prepared for Current Affairs section of Banking,Insurance exams and current affairs exam. India and Morocco agreed to enhance bilateral cooperation in the field of defence and security.Minister Delegate to the Head of Government in charge of the National Defence Administration, Government of the Kingdom of Morocco, Mr Abdeltif Loudyi is on a two day official visit to India. A five-judge Constitution Bench of the Supreme Court, led by Chief Justice of India (CJI) Dipak Misra, on Thursday scrapped the pre-Independence provision of adultery in the Indian Penal Code (IPC), which treats a married woman as a commodity owned by her husband. Section 497 (adultery) gives a husband the exclusive right to prosecute his wife's lover. If found guilty, the adulterer faces five years behind bars. World Tourism Day is observed every year globally on 27th September.“Tourism and the Digital Transformation” is the theme of this year’s World Tourism Day (WTD). Hungary is the host country for this year's WTD. India and Morocco signed an MoU for deepening cooperation between MSME sectors of the two countries in Rabat, Morocco.Through this MOU, the NSIC and Maroc PME will work together to enhance cooperation opportunities for MSMEs of both countries. It will facilitate transfer of Indian technologies and products to Morocco. The International Monetary Fund has agreed to increase its crisis loan package aimed at restoring confidence in Argentina's struggling economy by $7 billion to $57 billion, the South American country's Finance Minister Nicolas Dujovne said on Wednesday. Sultan of Oman:Qaboos bin Said al Said. 24th governor of RBI:Urjit Patel. RBI established on :1st April,1935 in Kolkata. Prime Minister of Morocco: Abdelilah Benkirane. Chief of Air Staff:Birender Singh Dhanoa. Headquarter of International Solar Alliance:Gurugram,India.